My wife and I use coupons for many of our household products, from toothpaste and garbage bags to toilet paper and Tones spices (yes, I had a coupon for this once upon a time). While we don’t use many for actual food products (since most of the advertised food is more or less junk food), we still do accumulate quite a few of them over time. This, of course, means that an organizational system is helpful. Of course, not every scheme works equally well for everyone, so I went around the web and found out how different people organize their coupons. I was inspired to do this by Carrie (an old friend who introduced us to cloth diapering), who lamented on Facebook recently that she was having a hard time keeping her coupons organized. So, without further ado, here’s a collection of various coupon organization schemes from around the web, starting off with our own. I use a coupon binder – a repurposed photo album – where all of the coupons fill up various slots in the album. This is often taken along on grocery store trips along with a grocery list that has an * by each item for which we have a coupon. See full details of my scheme. Crystal from Money Saving Mom (http://moneysavingmom.com/) uses a “coupon box” to keep her coupons organized. Inside of that box, she has a series of envelopes for various product groupings. When it comes time to make her grocery lists, she pulls out coupons only for the items she needs and puts them into an envelope for each store. See full details of her scheme. 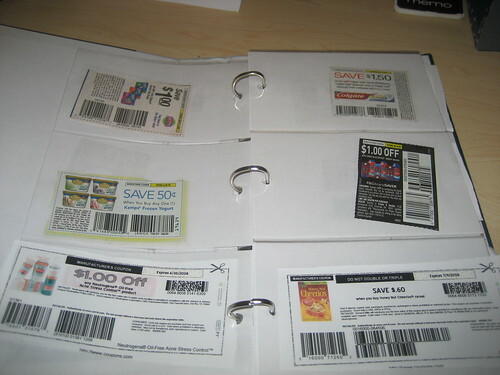 A Thrifty Mom (http://athriftymom.com/) uses a zippable binder to organize her coupons. It becomes something of a traveling “grocery shopping kit,” as the grocery list, a pen, and other useful items can be stored in it. It’s pretty self-contained and very portable. See full details of her scheme. Stacey Doyle from The Digerati Life (http://www.thedigeratilife.com/) uses a very similar zippable coupon binder and has a nifty YouTube video showing off how her binder works. Debbie from Destroy Debt (http://www.destroydebt.com/blogs/debbie) actually finds that the Dayrunner coupon organizer works best for her needs. It has an $8 up-front cost, but it’s small enough to fit easily in her purse, so she just always carries it with her. See full details of her scheme. Finally, Becky Robbins and Michael Greenley have a great debate at Helium about whether or not it’s even worthwhile to clip coupons at all. I think that it is, but I think you quickly reach a point of diminishing returns where further time investment isn’t worth it any more. The coupons we clip are mostly just the ones that basically fall into our laps or out of the Sunday newspaper. One final note: remember that everything has a price. There are a lot of coupon and sale combinations that will get you stuff for free, but even free has a cost. It takes time to get the item and, more importantly, it takes space to store the item. If it’s not something you’re ever going to use, it’s too high of a cost to pay. You never want to find yourself in a situation where your pantry is full of “free” stuff that you’re never going to use and you’re trying to figure out ways to jam more stuff in there. Coupon organization (and a moderate, reasonable time investment in it) can save you some money on stuff you already use – don’t go wasting time chasing “free” stuff that will just end up cluttering up your home.